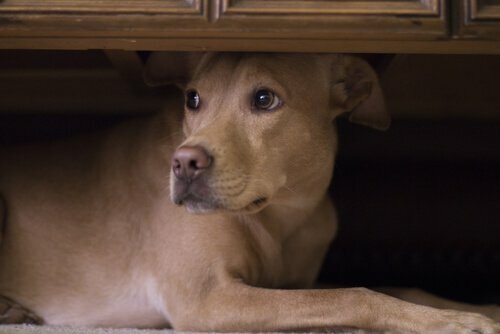 Does your dog hide under the table every time he hears thunder? Or does it start to tremble with pyrotechnics? That may mean that it is within the group of pets with noise phobia. We give you some tips to deal with a dog that suffers with very loud sounds. Animals have a much more developed ear that's ours. That's why many pets have noise phobias, even those that are not so high for us. In other cases, the dog is terribly afraid when he hears loud noises , such as thunder, firecrackers, honks or even the vacuum cleaner. One of the main symptoms of noise phobia is anxiety, which manifests itself through tremors, strange behavior, panting or even escapes. In turn, they can urinate or defecate in prohibited or unusual places, bark, howl or remain static in one place, almost always where they can cover their head: under the bed, a table, the sofa, a chair, etc. If you have never heard a particular noise before, , it is normal to panic or hide. If the animal has experienced an overwhelming event in the past related to a specific noise, probably every time you hear it increase your stress levels. Some dogs become more sensitive to noise over time , perhaps because they are weaker in old age or if they are sick. Did you know that a person can transmit fears to their pets? If you are afraid of thunder, it is likely that your dog will also experience that emotion. Do not forget that the personality of dogs is matched with its owner and 'copied' everything it does. In addition, we can indicate that certain dog breeds are more prone to noise phobia. Among them: German shepherd, Shetland shepherd, Border bollie, Welsh corgi, Australian shepherd and old English shepherd. You should bear in mind that when a dog is afraid of A noise is because he considers it dangerous. Therefore, the first recommendation is that you stay calm and do not transmit insecurity or fear of the animal. Many owners make the mistake - for lack of knowledge - to caress to your dog to comfort him. However, this is a wrong signal for him. Why? Because it relates to prizes or rewards. This is how you think urinating anywhere or barking is allowed. 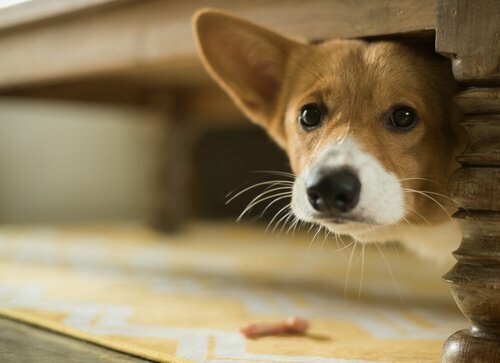 If a stormy night is coming, and you know your pet will be scared, the best thing you can do is encourage her to to take refuge in a quiet place and away from noise, as the bathroom. Let him find his place and do not bother him until it stops raining. Do not try to move it to your bed.Therefore, the owners have to know how to help them through the episode in the best possible way.